February had some really ups and downs in terms of getting goals done. I did at least a few of the items. I think my best learning from the book Say Goodbye to Survival Mode: 9 Simple Strategies to Stress Less, Sleep More, and Restore Your Passion for Life this month what I NEED to do lists. You can see more about that below. I slowly started back into as schedule for my life. It has been good. I’ve also backed off several things just to make sure I was doing okay. I did do crafts this last month, I just did not really get any of them posted at all. That will be something to work on. I got 2 projects in early. That made me feel good. I just need to keep going at my current pace and make it all work. I can say a lot of the family goals ended in failure. So I will be working on them again. Last month I got behind and it was horrible. I was dragging my feet every day. I don’t want to do that this time. Being ahead on projects is VERY nice. That is my goal to get ahead on things. Being just slightly ahead gives me time to plan more and do more. Do 3 ideas from the idea notebook. These are my year only goals for 3 Dinosaurs. These are the same as last month, but it is good reminder for me to post again each month. I have been printing my posts to review during the month. I have 2 years of posts that need to be updated. It is a lot of work. The family saying “See A Need” is still going well. I heard someone say “See a Need Fill a Need”. I love the phrasing added at the end. It adds so much more to the meaning of the saying. I did great with laundry this month until the girls were out of school. I hope to do better with it. I’m adding for my goals making a To Do list. I started using a to do list and it has made a difference. I like the idea of something I can check off. I did great with the menu but I found a error when I did not think about things like people that need lunches to go. I will be doing something about that. This month to help me with my To Do List. I made my own Free To Do List Printabel. I thought I would share it with you all. It is for 7 days a week. This makes it easier to plan for somethings I want to do certain days. I’m still using the printable from December for making my goals. This is also a link! Here are the people that are co-hosting this monthly! So don’t forget to post your goals if you have them! 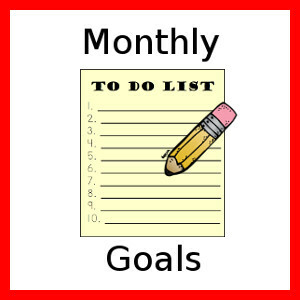 This entry was posted in goals and tagged monthly goals, printables, to do. Bookmark the permalink. I think you did fabulous! I love the printable and your goals. I am not sure I could ever go to bed with no Landry! Kudos. And congratulations on being ahead of the game… my youngest just started refusing naps, so I’m running so far behind! Thank you so much for preparing the printables. I absolutely love all of them and use them regularly. I know it takes a lot of time and preparation to make these available to everyone. Just wanted you to know how much I appreciate them! I pinned your To Do List printable – looks great! I’m a big fan of to do lists. Thanks for pinning it! I really have enjoyed them. wow! very organized with a to do list 😀 Some great blog goals I am just trying to get 2 posts out a week as well. I love the printables! I’m sure I’ll be printing them soon!